It's my favorite time of the Stampin' Up! 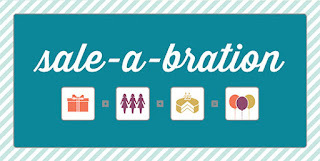 year - Sale-A-Bration!!! Why is it my favorite time, you ask? Well, because Stampin' Up! gives away FREE stuff! During SAB, which runs from January 22-March 22, for every $50 you spend, you will receive a free item of your choice from the SAB flyer (if you did not receive one in the mail, let me know, and I will send you one). Want to earn even MORE free products? Host a workshop during SAB, and you will automatically receive a free pack of Silver Glimmer Paper! When your workshop sales total $400, you will also receive the Sycamore Street Designer Series Paper, the matching Sycamore Street Ribbon & Button Pack, and Madison Avenue Stamp Set free, as well as $65 in hostess dollars to spend in the catalog how you wish, and 50% off any full-priced item! 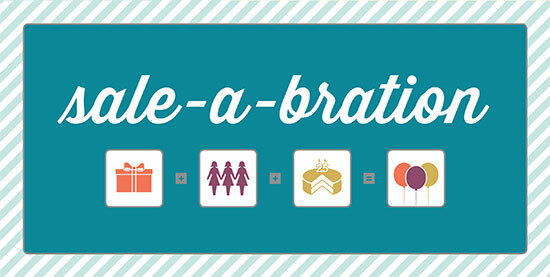 See the Sale-A-Bration brochure now. I'm offering a special gift to the first person to book a SAB workshop today. Email me today to book your date and claim your gift!